Home Beers Drugs Weed Let's talk about drugs! This morning my mom got chocked with some posts that I've put in one of my social media accounts. My post was about my resistance against the new laws that the Brazilian government is making to enforce the "war against drugs". "God bless you and help you to stop the consume of drugs. The use of weed isn't gonna make you a better person, it's the opposite. Now you're supporting in social medias the consume and legalization of drugs." To complete her words she said that she was disappointed with me. My mom is the most important person in my life, if love means affection, care, connection, understanding, respect and admiration, I have immense love for my mom. The fact is I'm a frequent marijuana user, since 1 year and half ago and I'm not ashamed to say it even for closer people, like my family and even my mom. My personal experience isn't gonna be share that much that time, I'll try to concentrate myself more in facts. The drug topic is a really complex one. Mainly because of the conception of legal and illegal drugs. From weed to antidepressants or from a medical to recreational consume of morphine or from alcohol to tobacco. Each country has their specific police for drugs. 1. Pharmacology. A chemical substance used in the treatment, cure, prevention, or diagnosis of disease or used to otherwise enhance physical or mental well-being. a - any substance recognized in the official pharmacopoeia or formulary of the nation. b - any substance intended for use in the diagnosis, cure, mitigation, treatment, or prevention of disease in humans or other animals. c - any article, other than food, intended to affect the structure or any function of the body of humans or other animals. d - any substance intended for use as a component of such a drug, but not a device or a part of a device. 3 - a habit-forming medicinal or illicit substance, especially a narcotic. This topic is super complex, from definition to governmental policies. Drug can be a beer or just a joint. What's gonna define if it's accepted by the society is the policies in the country. At the same time there are lot of legal drugs that saves people's life around the world. In 14 countries alcohol is forbidden such as Yemen, Sharja (UEA), Sudan, Somalia, Saudi Arabia, Pakistan, Mauritania, Maldivas, Libia, Kuwait, Iran, India (some states), Brunei and Bangladesh. It means that if you're buying or consuming alcohol in these regions with you will be breaking the law and you can be consider as a criminal. Countries that the recreational consume is legal: Uruguay, Canada, Georgia and South Africa. I'm talking about the ones that is completely legal, to consume and cultivate marijuana. Other countries already decriminalized the recreational use of marijuana, such as: Netherlands, Argentina, Australia, Bermuda, Chile, Colombia, Croatia, Czech Republic, Finland, Germany, Israel, Italy, Jamaica, Luxembourg, Malta, Peru, Poland, Portugal, Switzerland and Thailand. Each country has specific polices that can be for the full decriminalization like Czech Republic that the government defines that isn't a crime to have possession of 10g or cultivate 5 plants and in certain situations like Filand and Thailand, where it's illegal, the law is unforced. In total 35 countries allow the use of cannabis for medical proposes and 13 other countries where the government allow it, but with several restrictions: It includes Brazil. I'm being a regular marijuana user. I'm in the effect of the THC content in the joint that I smoked before writing this article. I'm not here to indoctrinate or influence you to consume weed nor support the legalization or use of any kind of drug, but I'm personally pro the decriminalization of certain illegal drugs, including Marijuana. In fact we all consume a different kind of drug, by definition at least. I pretty much like this definition thinking about a substance that we consume that affect the structure or any function of the body of humans. Depending of the substance that you consume and the amount, it's gonna have different reactions in your body. Legal drugs with the worse side effects: Mirapex, Abilify, Flomax, Alli, Ortho-Novum, Chantix. If you have some patience, check the side effects of each of them here. Reminding that all of them are legal to consume in most of the world. Maybe the deadliest drugs in the USA, showed by the graphic can make you understand better how legal drugs are practically more harmful than other illegal ones. This informations weren't collect by activist groups, it was from the DEA in the USA. 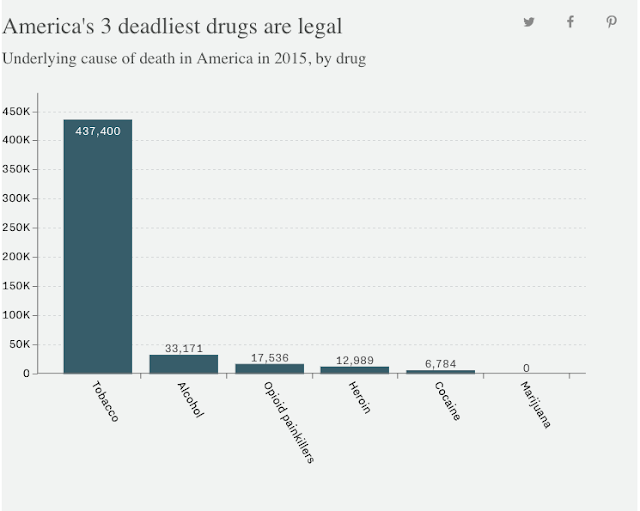 Just imagine why tobacco and alcohol are really well tolerated in our society with together almost half million people in the USA died in consequence of the consume of legal drugs such as Tobacco, Alcohol and Opioid painkillers. On the other side marijuana still with no deaths in result of the consume is still illegal in 25 states and the simple recreational consume is considered a misdemeanor. The discussion why the weed is currently illegal is another complex topic related with colonialism, religion principles, racism and social aspects. This is really complex my friend. 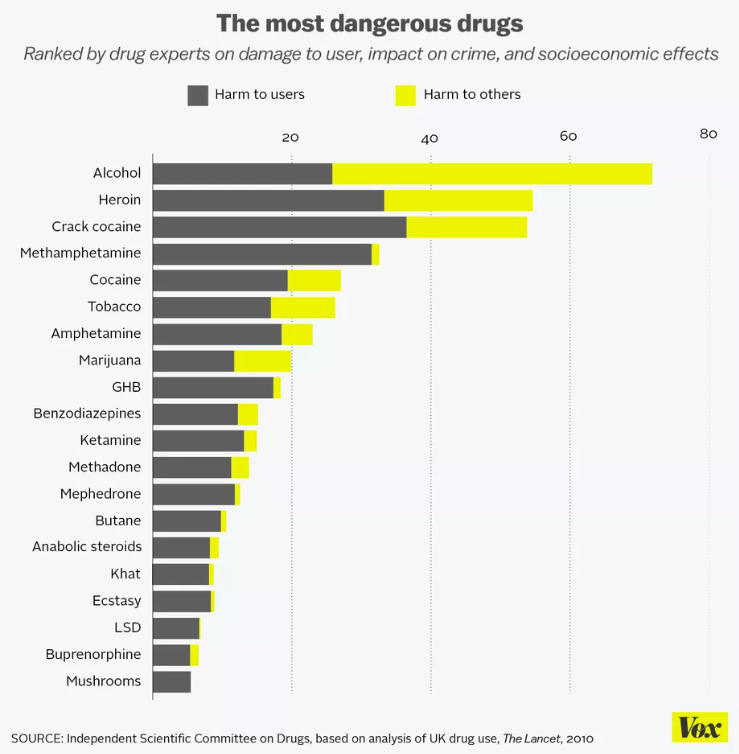 I don't have any precise answer concerning drugs polices in different countries, each country has unique cultural and social aspects that there isn't a simple solution for solve problems that the consumption of drugs effect the society in general. I'm not judging the consumption of legal drugs either. It wouldn't be a problem if the high consumption of tobacco wouldn't be a global health problem or if high consume of alcohol can have strong impact in your body or make you be aggressive and potentially risk for yourself and others. What I would like to do is opening is a discussion to start to talk about drugs, in any scale, from the legal to illegal ones. The excess consume should be treated as a health problem, like an alcohol addiction or medicaments mental and physical effects and policies to reduce the consumption of tobacco. Every year 7 million people dies in result of the consumption of Tobacco. 7 million is equivalent of the population of countries such: Bulgaria, Serbia, Paraguay or Laos. About alcohol? There are a lot of short and long term effects that the consumption of alcohol can effect us: Check it out. Teen alcohol use kills 4,700 people each year. That’s more than all illegal drugs combined. Drunk driving costs the United States more than $199 billion every year. 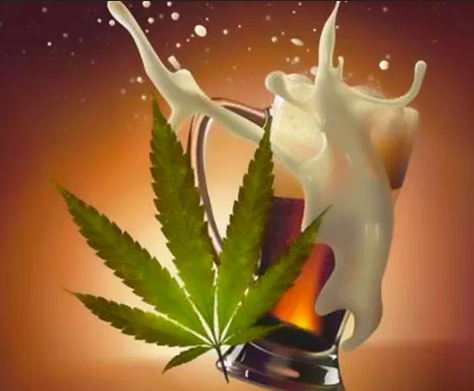 Yeah, alcohol and tobacco are widely legal and accept in the society as a social habit, but Marijuana is treated as a serious problem that should be treated in our society. As it's happening in Brazil now, making the state more powerful to face the "Drug war" stronger, not with education, health, social, economical and a clever smart strategy, like the 20 countries that decriminalized and 4 that legalized the recreational consume lately. In the case of the Brazilian government with ideologies absorbed by christian, militaries and conspiracy theories groups have been created these conservative bubble that now is "on the power" of the country. This bubble isn't fighting just against drugs, it's a group that now is leading by a president that is explicitly homophobic, racist with politics of hate, violence, intolerance, non supporter of minorities and pro environmental destruction and applying current policies removing labor rights of workers and rising their tax, while who has more are earning more profit in the ending, it just rise the Brazilian inequality. I told to my mom that fight against drugs isn't going to the ghetto and exterminate a musician with 80 shoots in his car by 12 soldiers because he was suspect to be involved with the drug trafficking. It's about investigate how 445 kg of "pasta base" for cocaine were found in the helicopter of a ex senator in Brazil, Aécio Neves, 6 years later and after several investigations, including corruption and justice obstruction, he's now congressman and still free. The law in Brazil has different weights depends who you are. Our society is so unequal that depends who you're, you're gonna have different privileges than others. By your influence, economical status, color skin, gender, sexual orientation, religion and others. I'm trying to give as much information I can give in this topic now, using as less personal opinion as I can, but as I writer, as a being human even being informative, my personal thoughts are part of it. After this bunch of information, if this topic interested you, try to work in your own idea of understanding, decriminalization and legalization of drugs, try to think more about it, search for informations online or in books, try to surf in some articles or even random searches in wikipedia about drugs and the most important, try to talk with people about this topic, certainly you guys can build an idea out of it. You have a brain to exercise, to use, not put it in a cube and live your life without being critic and follow cultural behavior from an specific society or social or religious groups. The system is a big hand dictating what's correct and what's not with simple answer, the only way how to change the world is opening these boxes, searching for knowledge and being open to chance ourselves first.